It turns out that that we were going against Morogrim Tidewalker. It seems if you aggro Tidewalker then some of his murlocs despawn. So we sent the rogue.. who promptly got run over by a pat.. and popped out of stealth and died before getting to Tidewalker. Doh! To be fair, he’d never seen the pats before and didn’t know their path. We mulled it over for a while and eventually they decided to send a stealthed druid in to die. Well.. 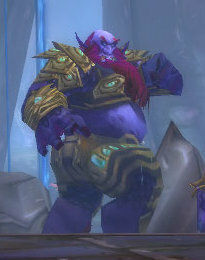 I was feeling spunky.. so while they were talking it over I conjured up Kilrogg’s Eye and sent him in to see Tidewalker. I’d read that although they have only 1 HP, you can attack with Kilrogg’s Eye. 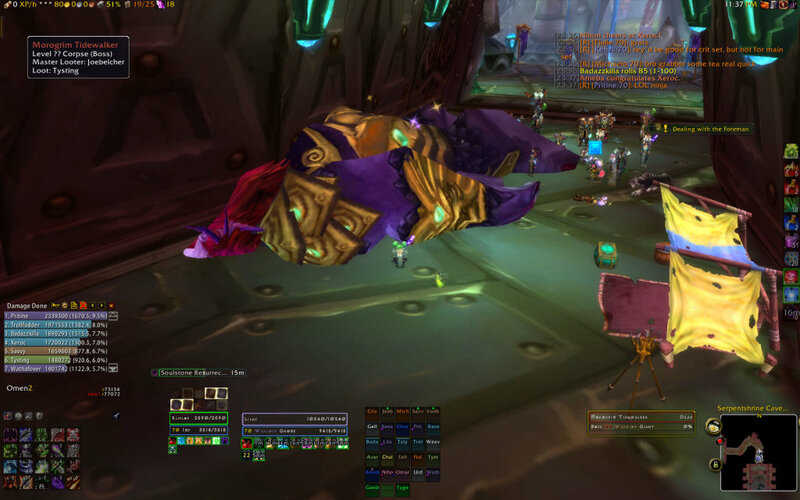 I ran the eye right up to Tidewalker.. and attacked him (right click). He did the “I’m going to eat you up” emote (or whatever it is he says when he aggros) and promptly mushed my eye. Almost immediately the designated druid aggroed him and was killed. There’s some suggestion that it was the druid’s death that reset the Murloc trash.. I think that’s hooey! I bravely sacrificed.. well not much 🙂 and despawned the murloc before the druid foolishly sacrificed himself. I hope to get to try it again in the future to prove that the Eye of Kilrog has at least one use. We stepped forward and started taking out the not-despawned trash. Wow.. I’ve never really hated murlocs.. just kinda find them annoying.. but WOW seriously huge murlocs with big scary teeth. Here, obligatory “Lilac dead” picture. On our first attempt (with no battle rezzes/soul stones) we got him down to 27%. 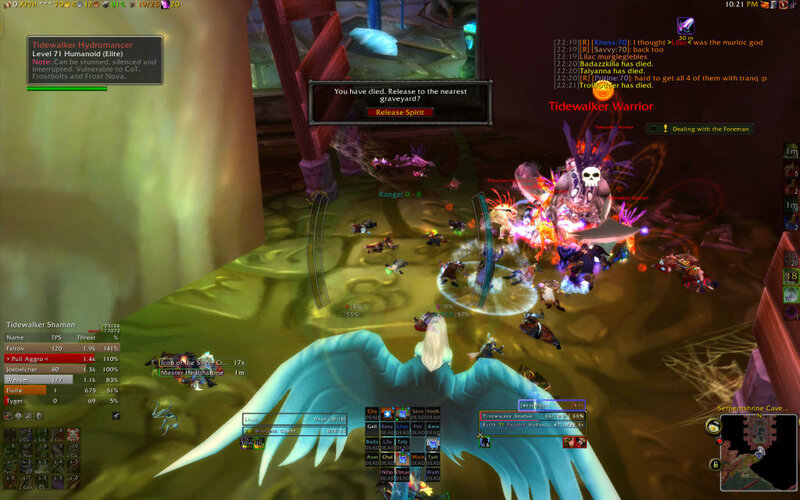 We ran into problems in that the Protection Pally tanking the murlocs got “Watery Graved” twice in a row. Then the murlocs ran amok and killed first the healers.. and then everyone else. We ran into the same problem on our second attempt. I think we were on our third or fourth attempt when we downed him. 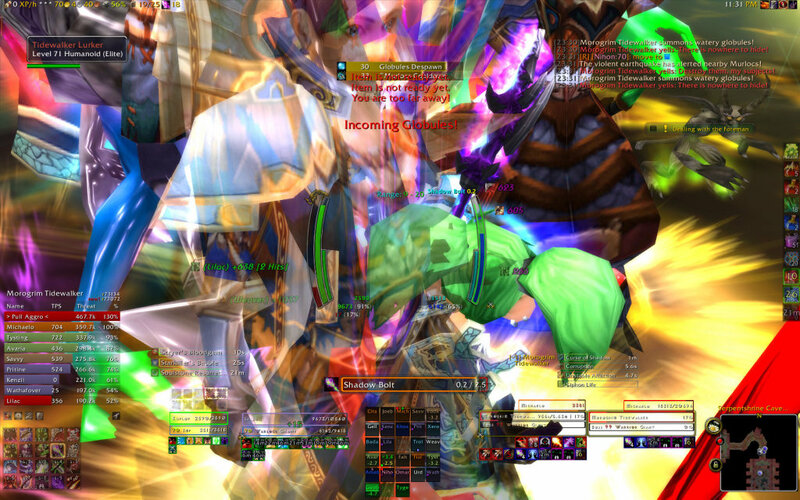 When we got to 25% the tank pulled him back into the hallway.. and we all ran to stand against the wall to continue DPS. Initially I had a -really- hard time getting my camera set. I spent most of 25%-0% blind shooting him. Ugh. There’s a reason I don’t tank. He dropped stuff… one was some shoulders.. Lilac’s wearing FSW Shoulders. The dropped shoulders are better in stats.. but worse in straight +dmg. So I passed. According to Recount Lilac was pushing 800 DPS. That’s a record for me without seeding. I’m pleased about that. Since we had 4 mages in the raid using arcane explosion on the murlocs I spent the whole fight keeping dots up on Morogrim. Occasionally if the trash seemed to be taking a long time I threw in a Rain of Fire.. but most of the time on the murloc adds, by the time I got 2 seeds off they were all dead. So I spent nearly all of the fight hitting Tidewalker. It was alot of fun and I’m very please to have been able to participate in this fight. Hehehe, those murlocs are fun! I remember one epic battle where we were left with myself, the MT, one healer, and a hunter on a full pull of those murlocs – everyone else somehow died to them! It was a battle of epic proportions… ten minutes of dpsing down murlocs one by one, unable to use Seed because I would pull aggro and die. Eventually there was just myself and the tank left, with two murlocs standing. We popped just about every trinket, ability and potion we had, and just barely managed to take them down. Never have the cheers been so loud! I am glad to hear that you enjoyed the experience! What fun! I am hoping to be able to be picked up for occasional raids now that I’m a Freelance Raider of sorts, but at the same time I’m spending a bunch of time getting my lowbies up to 70 so I can use them as well. I have video footage of me on my Frost Mage while we took down Morogrim Tidewalker once, it was a great lot of fun, because of course I get to do a lot of AOE damage on all those Murlocs and timed right, IceBlock is a huge savior when you’re put into a watery grave. One day I’ll get it posted 🙂 In the mean time, glad you had fun!